Many observers of the Greek debt crisis believed that after the referendum matters should return to the negotiating table in Brussels for a new round of painful arm-wrestling between Greece and the troika. Before the referendum, it was widely held that a yes vote would shift the balance towards the troika, while a no vote would increase Greece’s leverage in the negotiations. The underlying assumption has been that it is perfectly rational for the troika and Greece to return to the negotiating table after the referendum. But within hours of the humiliating referendum outcome, the troika regrouped, stood up and delivered a new blow, resulting in the resignation of Greek Finance Minister Yanis Varoufakis. It is tempting to believe the departure of Varoufakis is a paradigm changer. In reality it is a non sequitur. 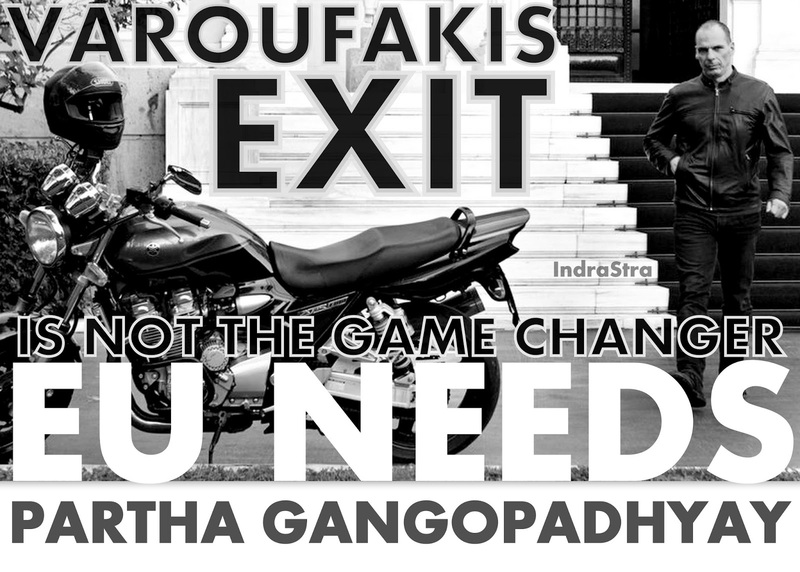 The eurozone is in real crisis and changing the finance minister of Greece is akin to shuffling the deckchairs on the Titanic. The minister’s fate was not a shock to everyone - he failed to create sufficient ambiguity. Neither Varoufakis nor the troika has ever mastered the art of tightrope walking, so the negotiations between Greece and its creditors became fraught with deeper and deeper challenges as time wore on. Just before the referendum took place, the IMF had started recanting its position on Greece, acknowledging Greece would need far more support, along with debt relief, to turn its economy around. This makes the negotiations in Brussels a wild goose chase and both parties know of their futility. Would it be fair to ask whether the negotiations were a hoax? It is an open secret today that the IMF’s policy stance on Greece was a victim of Dominique Strauss-Kahn. In his usual style, he brushed aside professional advice from his economists and objections from many developed nations and put the rock of austerity around the neck of Greece, leading to economic stagnation. The troika sought to make Greece compete in an international swimming championship when Greece couldn’t even float with that rock tied to its neck. Deep down, the European Union has fundamental flaws. Any attempt to put a fix on the Greek crisis without rectifying these fundamental flaws will inevitably fail regardless of who is the finance minister of Greece or Germany. The EU is nothing but a dualistic system with a north-south divide in productivity: most of the southern economies can’t compete with the northern ones, which inevitably leads to trade imbalances between them. Since the entry of Greece into the EU, the north has maintained a trade surplus while the south has suffered from a trade deficit. The desire of southern governments to create investment booms for increasing productivity led to their indebtedness, with little impacts on their relative productivity vis-à-vis northern EU nations, but with a rising gap in their cost of production due to increasing wages. This begs a question of how the EU can overcome such long-run problems. One possible model can be found in Germany’s constitution. The German Basic Law (Germany’s constitution) is founded on the philosophy of ensuring each tier of government has adequate access to financial resources. It is graphic about the allocation of revenues from the major taxes among the Federation, Länder (German states) and municipal governments. All three tiers of government share the personal income tax while the Federation and the Länder share corporate taxes and the proceeds from the German value-added tax (VAT). Beyond this agreement, even if there is no constitutional mandate, a business tax is also shared among these three tiers of government. This fiscal equalisation ensures that the poorer Länder are equalised to at least 95% of the average revenues of all Länder. In the absence of fiscal equalisation and the divergence in productivity, the current Greek negotiations will fail to overcome economic dualism in the EU. The EU will move from one crisis to another if it relies solely on negotiations of debts without real reforms in the fiscal arena.